The basic idea of sensory play is any activity that involves and stimulates a young child’s sense of smell, sight, hearing, touch or taste. Some activities can even involve all five senses! Anything that can encourage a child to investigate, create, play and explore is always a good thing. 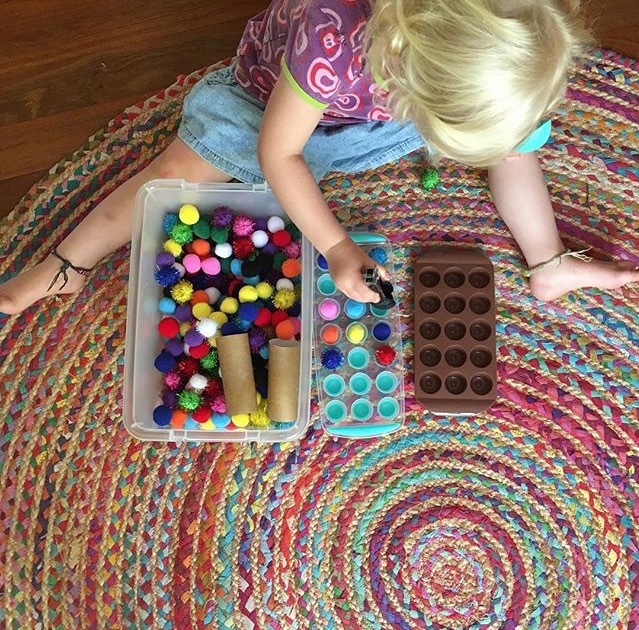 A simple and easy way to integrate sensory play into your child’s day is by creating a sensory tray using a long narrow under-bed storage container and filling it with a variety of things for your child to explore. It’s always a good idea to keep sensory trays outdoors to reduce and contain the mess and then maximise the fun. Sensory trays can be used (with supervision) from the age of about 18 months, and can be enjoyed all through primary school, too. Our favourite place to find “tools” for sensory trays are cheap shops: lolly-scoops, measuring cups and spoons, ice-cream scoops, funnels, cutters and little cups and containers for filling and emptying. You can also buy small animal figurines, beads, glitter and sequins to enhance the play experience further. Try filling your sensory tray with uncooked rice, a few drops of vanilla essence and a selection of mixing and pouring elements and watch as your child explores. You can add little animal figurines, cupcake patty pans, muffin trays and scoops. Even adults can enjoy the relaxing therapeutic process of running rice through their hands! 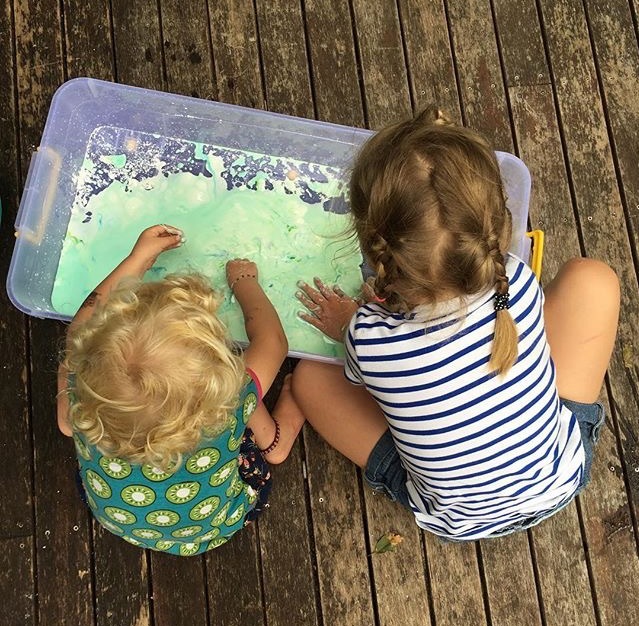 Try emptying 3 canisters of shaving foam gel into your tray (cheapest is fine), along with a few drops of food colouring and a drop of peppermint essential oil for a sensory delight! Watch as your child explores with their hands and even their feet. You might want to have a hose nearby for this one when they’re ready to be finished for a quick and easy clean up… or you could even do the activity in the bath! Try adding some pompoms to your sensory tray, along with some old toilet rolls to push them through, an ice-cream scoop and some cups. You could also extend this experience by teaching colour sorting, counting and categorisation. Just don’t let the cats near this one unless you enjoy picking them up from all over the house. I speak from experience. 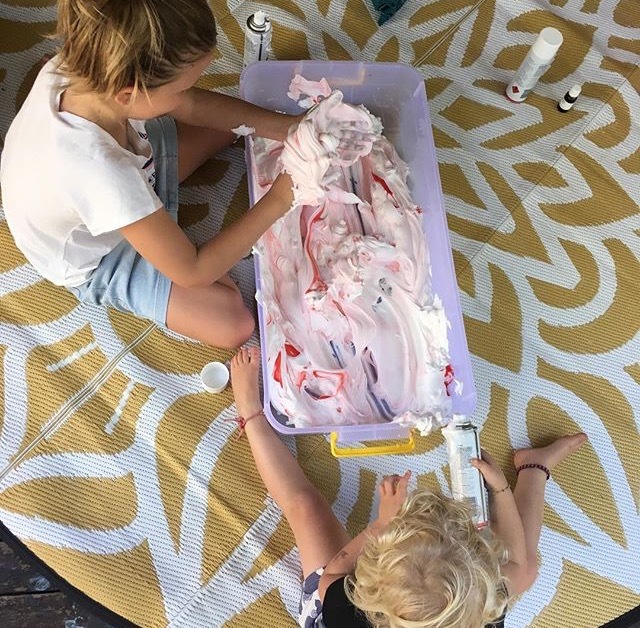 Another fabulous messy one! Try adding one packet of cornflour to about 1 cup of water and a few drops of food colouring and combining in your tray. Ooblek is a weird substance in that, like Kinetic sand, when it is held firmly in the hand it stays hard and then it turns back to liquid. It’s fun to play with and explore just on it’s own but your child can also try running cars through it, using a colander or strainer, using mixing bowls or even experimenting with colour mixing by adding different food colourings to it. Ooblek doesn’t keep, so toss it out when you’re done and hose off. Sensory play is a fun thing to do with your child, and after a while you may even find yourself thinking about the different things you could add or switch up your tray with. Other fun ideas are dry pasta, shells, shredded paper, bark and even dirt to make a mud kitchen. Have fun exploring together!